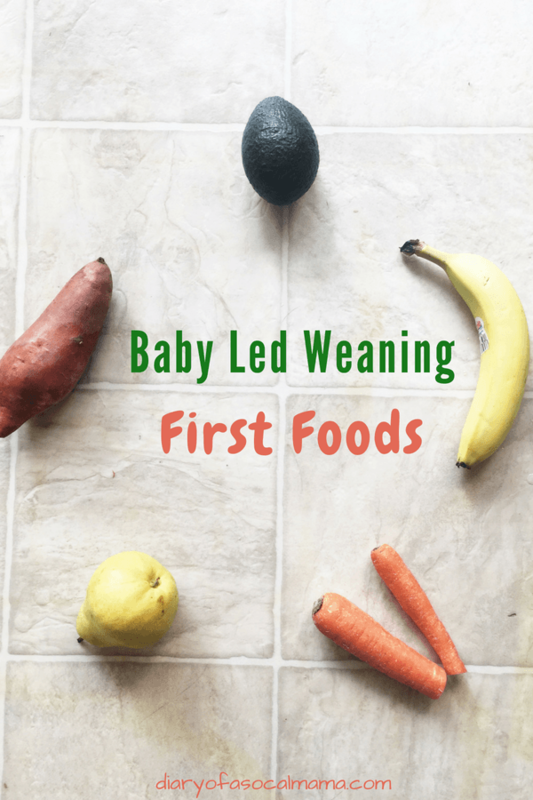 So hopefully by now you know the basics of baby led weaning. You’ve checked off all the signs of readiness, you know the do’s and don’t’s. Now, what do you feed them? And how do you prepare it? Choosing that first food can be so exciting! 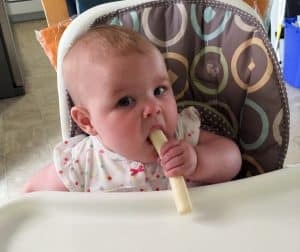 I’m pretty sure the first thing my daughter had was a string cheese…at least it’s the oldest photo I can find on my phone and as a first-time parent I pretty much-documented everything! But string cheese didn’t make my list of baby led weaning first foods, read on to find out what did! First foods is a bit of a misnomer. When doing baby led weaning, remember the idea is that your child eats what you eat, within reason. So you should not be regularly preparing a special meal or items just for them. Simply use these techniques to prepare food appropriately for them. For this post we’re talking about how to prepare foods for a baby that is just starting baby led weaning, what I like to call stage 1 foods. I’ll be discussing how to prepare foods for later stages in a future post. As always, please remember that this post and all my baby led weaning posts are simply based on my research and experience. Please consult your pediatrician to ensure these things are appropriate for your child. Every child is unique so be sure to do what you know is within their capabilities. This post includes affiliate links. If you make a purchase after clicking one of my links I may earn a commission at no additional cost to you. Now that your child is ready to start baby led weaning you need to prepare food for them to try! It’s important that foods are prepared properly so as to reduce the chances of choking. The general rule of thumb is that for stage 1, foods should be cut into strips about the size of your pointer finger. They should be cooked or ripened so that they are soft enough to smoosh between two fingers. Don’t worry if your baby doesn’t have any teeth, their gums are quite strong. Avoid giving your baby anything that is coin-shaped as that shape could more easily get stuck in their throat. To avoid having to eat mushy vegetables yourself simply cook vegetables and then remove all but a small portion and let those continue to cook until soft. Alternatively, you could microwave your child’s portion to soften it up more. What about spices and salt? Most of us eat way too much salt! Your child is little, so you want to really watch the amount of sodium they are ingesting. Use herbs for flavoring instead of salty seasonings, or simply remove your child’s portion before adding salt or other high sodium seasonings. You don’t have to give your child bland food, go ahead and use herbs to give their food some flavor! You want to expose them to lots of different tastes and textures starting at a young age. Remember, the idea with baby led weaning is to have your child eat what you eat, within reason. So let them try some of whatever is on your plate. But the foods below are great options to work into your meals or for when your food just isn’t suitable for your child. Bananas – Bananas are a great option for a first food. You’ll want to use a very ripe banana so that it’s very soft. You can prepare it one of two ways. You can peel the banana, cut it in half or thirds depending on the size, and then cut it into strips. Alternatively, you can wash the outside of the banana. Then cut it in half and expose a small bit of the top of the banana. 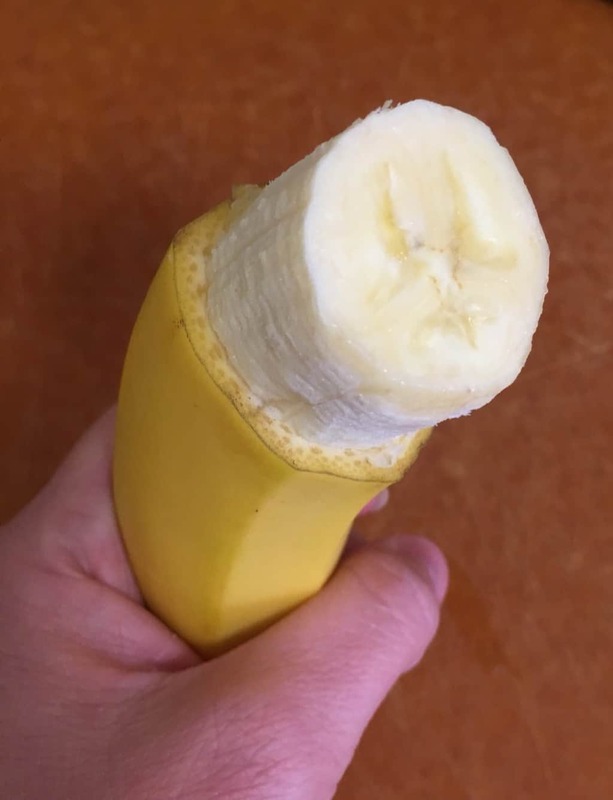 The peel and the rest of the banana then becomes a handle that your child can easily hold. Sweet potato – Sweet potato is a great and healthy option. It has iron in it which is especially important for breastfed babies as iron doesn’t transfer via breastmilk. You’ll want to clean the potato with a vegetable brush. Then steam or bake the potato until soft. I usually prepare them in the microwave. Poke some holes in the potato with a fork, wrap in a damp paper towel, and microwave a couple minutes at a time until the potato gets soft. 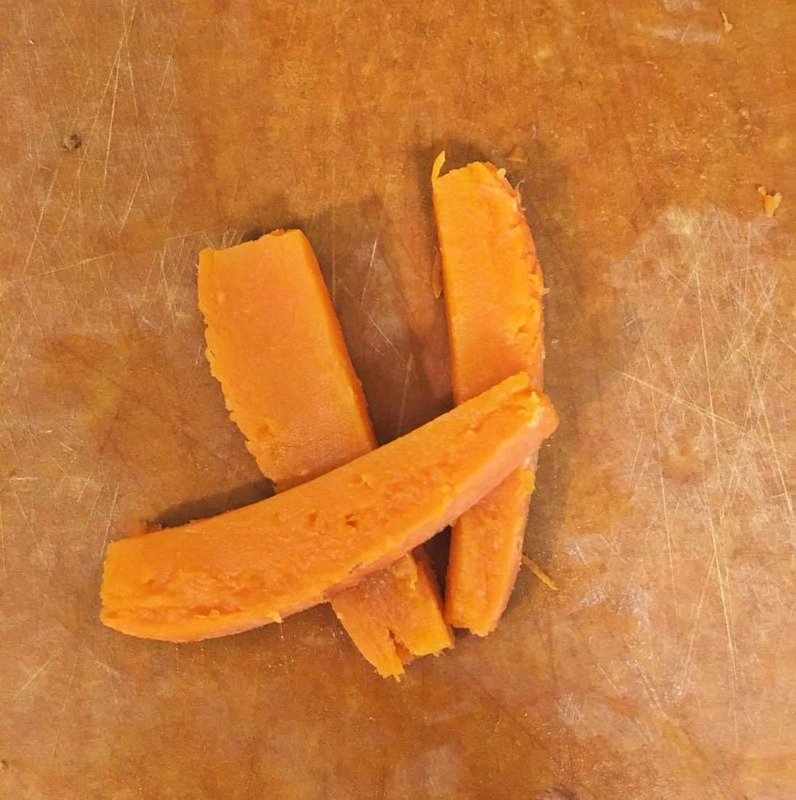 Cut the potato into finger sized strips and allow to cool before giving it to your child. Ripe Pear or other fruits – Pear remains a breakfast staple for my little girl. It’s great as an early food and requires little preparation. Make sure the pear is very ripe and soft and simply cut it into strips. When you’re just starting out, as a stage 1 food, I would also remove the peel. You can use the same tricks from the avocado to help make the pear easier to pick up. You can do the same with peaches or other soft, ripe fruits. Avocado – Avocados are a southern California staple! They are also a great source of healthy fats. My daughter will demolish an entire avocado in one sitting. 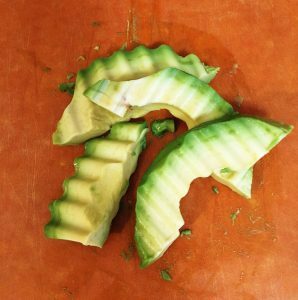 To prepare it for your child you’ll need to cut the avocado in half, remove the seed, and cut it into strips. There are two ways to make it easier for your child to hold. My favorite way is to use a wavy knife to cut the strips. The grooves will make it easier to hold. The second option is to coat the strips in crushed puffs or cheerios. The coating will help keep it from being so slippery. Carrots – Carrots can provide great nutrition for your child. Steam them until they’re soft and cut into strips. Remember, they should be soft enough to squish between two fingers. Ensure the pieces are not round as you never want your child to get coin-shaped pieces off. 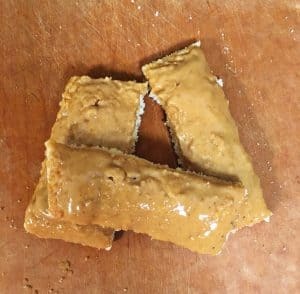 Toast sticks with peanut butter or hummus on them – They now recommend that allergens, like peanut butter, be introduced early on, unless you have a family history of food allergies. Lightly toast a piece of bread and smear it with peanut butter or hummus. Just keep an eye on your child to make sure they don’t break off a large piece of the bread. Keep the peanut butter light as too much peanut butter could become a choking hazard since it’s so sticky. Make sure to use smooth peanut butter with no honey in it, babies should not have honey before age one, and nuts are a choking hazard. Applesauce or yogurt – Things like applesauce and yogurt are a little bit of a hot-button issue when it comes to baby led weaning, as they are essentially purees. But if the food is generally eaten as a puree then you should give it to your child that way. The real debate is whether it’s ok to spoon feed it to your child or whether to only give them pre-loaded spoons. Personally, I always fed it to my baby. It wasn’t until closer to 14 months that I started pre-loading the spoon and letting her try for herself. It is recommended, especially early on, to not mix a liquid/puree type food and solid foods at the same time as it may make your child more likely to choke. They could get confused as to what to do with the different types of food. If you are spoon feeding just make sure you are letting your child lead. Let them request more and stop when they stop. No airplane games or trying to coax them into eating more than they want. Example Meal – An example meal could be tacos. Say you are having chicken tacos for dinner. You may give your child some avocado strips. A strip of chicken to gnaw on. And a tortilla with some beans spread on it. Be sure to watch in case they start to gnaw off a chunk of chicken or tortilla. At that point, I would break off that piece and let them start again. (In the beginning, it’s unlikely they’ll be able to break down something as tough as tortilla or chicken.) This way they will be exposed to the taste of chicken, tortilla, and beans. The avocado they should actually be able to eat, just make sure it’s ripe and soft. How often should you feed your baby solids? There is no right answer here. You can try it as much or as little as you like. In the beginning, they will most likely play with the food and do very little actual eating. In the beginning, food is more for learning about feel, texture, and gaining motor development skills than actually eating. You should be offering your child breastmilk or formula BEFORE offering solids. It’s generally suggested to offer it about 30 minutes prior to offering solids. Breastmilk or formula will remain the main form of nutrition until they are about one year old. I started with one meal a day, breakfast or lunch, and worked my way up from there as she got the hang of it. I recommend doing it at breakfast or lunch in case of an allergic reaction or upset tummy. No one wants to be up more than you already are at night. Before you know it they’ll be demanding to eat at every meal! Have questions? Drop it in the comments or email me at shari@diaryofasocalmama.com and I’ll do my best to help. Subscribe to my newsletter if you want to read future baby led weaning content. I’ll be writing many more posts in the coming months! My daughter always struggles to feed herself banana (her favorite) because it is so slippery, I had never thought of leaving the peel on so she could use it to get a better grip! Such a great idea, thanks!